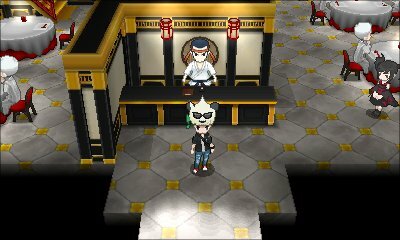 Dotted around Lumiose City, there are various Restaurants, all accessible through the taxi going to fine dining. In here, you have the ability to purchase a meal for a certain amount of money. However, between the various courses of the meal, you have to battle. There is a catch, each dish requires you wait a certain amount of time before you can tuck into it. This time is determined by the amount of turns your battle takes. You get marked based on how accurately you get the turns. If you get less or more than the designated turns, then the meal will spoil. If you lose any Pokémon, you will also be marked down. At the end of the meal, you will get a gift for participating such as berries or nuggets. The price to enter also reduces as you get more stylish. When you complete each of the battles with a perfect amount of turns used, you will get a star next to the battle when you go to select them again.